To mark the 18th Anniversary of UNSCR 1325, ICAN partnered with the Dutch Gender platform WO=MEN, Cordaid, Oxfam Novib, Care Netherlands, Women’s international League for Peace and Freedom (WILFP) and the Permanent Mission of the Kingdom of the Netherlands to the United Nations for Reality check: What is working in Yemen and CAR when it comes to international support for women’s leadership in peace and security? 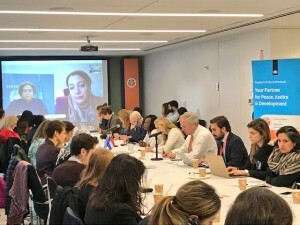 The October 24 event focused on identifying concrete opportunities to improve international support for the meaningful participation of women from Yemen and the Central African Republic (CAR) in humanitarian response, peacebuilding and security. Ambassador Karel van Oosterom, Permanent Representative of the Kingdom of the Netherlands to the UN moderated the discussion. Speaking to the context of the Central African Republic, Nadia Fornel Poutou, executive chair of l’Association des Femmes Juristes de Centrafrique (AFJC) highlighted the responsibility of the international community regarding security needs of survivors of sexual and gender-based violence (SGBV). She noted that members of the Security Council should make a stronger effort to respond to these needs in peacekeeping missions, such as the United Nations Multidimensional Integrated Stabilization Mission in the Central African Republic (MINUSCA). Efforts by local organization working with women and children need increased support, including mechanisms to facilitate assistance for women and children who have been abused. The speakers from the ground were followed by a response panel tasked with tackling some of the points put forth by the panel. 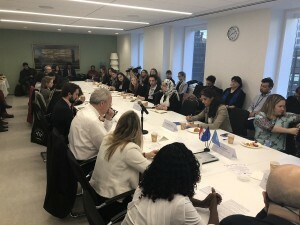 Radwa Nour, Senior Peace and Security advisor, Office of the Special Envoy of the Secretary General for Yemen asserted something that we often hear from WASL members in particularly Syria and Yemen namely that, [women’s] advisory groups are not participation! Rather they are there to tell us what to do and what not to do. Referring to the work Ms. Jarhum is doing with the Peace Track Initiative, Ms. Nour said that, “women have helped draft plans of action.” Many of these women have mastered the craft of local peace mediation and have in-depth knowledge of the realties in which they live. Furthermore, she noted that it is not just about increasing participation at the negotiating table. 95% of decisions are actually made outside of the room, and there is a need to enhance these informal conversations as well. The persistent funding gaps and the demand for increased resources directly to local women led initiatives was repeatedly highlighted throughout the conversations. In her response to the panel, Sarah Douglas, Deputy Chief of UN Women’s Peace and Security Division said, “We need to stop relying on women’s volunteer work and focus more on sufficient funding and economic recovery of women in conflict affected countries. 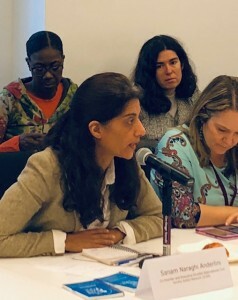 A proper gender analysis is key to allocating funding for WPS work.” She also highlighted the responsibility to protect women human rights defenders and mentioned Ms. Poutou’s work in CAR as an example of the increasing threats and risks that women face. ICAN’s Founder and Executive Director Sanam Naraghi Anderlini was the last speaker of the morning and her points were clear and direct. Ms. Naraghi Anderlini started by calling for an end to apathy, ad-hocery and amnesia, emphasizing that, “the [WPS] agenda is about bringing a human lens to the discussions; it’s about responsibly sharing – not power sharing.” In that regard she said, “Men-made crises such as in Yemen and CAR call for women-made solutions.” And those solutions need funding! “This is about money,” she added. “We need to put our money where our mouths are and our mouths where our money is. Defunding non-inclusive processes will make them inclusive processes.” The presence of women in peace processes should not be cosmetic or an add-on. It is crucial for inclusive decision making and integrated responsibility sharing.